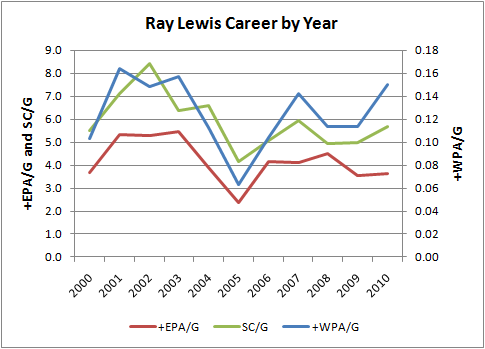 Advanced Football Analytics (formerly Advanced NFL Stats): When Will Ray Lewis Slow Down? Lewis entered the league in 1996, and 15 years later at age 36 he's still producing. Last Sunday, all Lewis did was notch 7 tackles (for a 1.3 TF) , a forced fumble, an interception, and two passes defended, all good for 8.5 points of +EPA. That's all. As a Baltimore guy, I fear the day the day when Ray hangs up his cleats. So I plotted his performance by year (since 2000 for regular season games) in terms of +WPA per game, +EPA per game, and Success Count (SC) per game, expecting to find some sort of noticeable decline. And that's exactly not what I found. The graph is plotted on 2 different axes. The red line is +EPA/G and the green line is SC/G, both of which are plotted with the primary (left) vertical axis. The blue line is +WPA/G and is plotted on the secondary (right) axis. If the graph ended at 2005, you'd think that Lewis was in the twilight of his career, but he's been making plays at a very high level since. He peaked somewhere between '01 and '03, but there's been no lasting decline to speak of. Additionally, aside from Lewis' consistency, the fact that +EPA/G and SC/G appear to move in lockstep suggests each 'success' play may be roughly equivalent to about 0.7 net points. He was hurt in 02 and 05. Probably injury-related. He's been healthy the last few years now. Improving health for a player his age is remarkable indeed. It usually runs the other way. I'd put all the usual things about juicing here, but it's doubtful that he does anything that other football players aren't also doing (ie, everything you can possibly do, most likely). Simplest answer is that he's blessed with good genetics and luck. Lewis begged for a big body up front after he was having trouble with dealing with OL on him. It sounded like whining at the time, but entered Haloti Ngata, and Lewis went back to form. It's not quite that simple, but it seems like Lewis knew what the D needed, or at least what would really help him. Forgot to post under name on last one. Lewis's play seemed to truly trend up right alongside his improved DL play. Do your metrics show good correlation with decreased DL play in 03-05 for the Ravens, picking up in -06 to present, Brian? Lewis was the DPOY in a 3-4 defense in 2003 and was a 1st team all pro in 2004 in the defense (before Ngata was on board). He was having a fine season in 2005 before he went down with an injury. The only thing missing in 2004 was the big play/turnovers he has the previous season. It has become a popular misconception that Lewis was playing poorly before Ngata came around but that is untrue. By all accounts Lewis has one of the most intense work out regimens in the NFL. The guy missed five snaps all of last year. 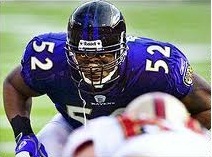 He is already the best ILB of all time, and is making a case for the best defensive player of all time. It is simply incomprehensible what he is doing after 16 years in the league at ILB, when even the greats only lasted 11-13 years and were done. It is flat out unheard of to play at this level, at that position, for so long. And he probably has 2 years left minimum. 18 years playing at a high level smashing into running backs and offensive linemen week after week?? Most would say impossible, but Lewis is proving them wrong. Oh, and he hasn't missed a game since October. 70 games including the playoffs.